As a manager, you're shouldering more and more responsibilities from maximizing your team's performance to increasing your company's market share to building profitable customer relationships. On top of all that, you need to orchestrate your own time and keep your career on track. The challenges are stacking up but, you've got less and less time to figure out how to tackle them. How are you supposed to resolve this dilemma? Happily, help is on the way: the new Management Tips from the Harvard Business Review. This concise, handy guide is packed with quick tips on a broad range of topics, organized into three major skills every manager must master: Managing yourself; Managing your team; Managing your business drawing from HBR's popular Management Tip of the Day, the book puts the best management practices and insights, from top thinkers in the field, right at your fingertips. Pick it up any time you have a few minutes to spare, and you'll have a fresh, powerful idea you can immediately put into action. You may not be able to do much about being time-starved. 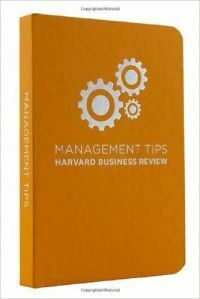 But with Management Tips from the Harvard Business Review as your guide, you'll stand the best chance of succeeding in your role as a manager. by Morgen Witzel is a Fellow of the Centre for Leadership Studies at the University of Exeter Business School. He is the author of more than twenty books, including the bestsellers Tata the Evolution of a Corporate Brand and Doing Business in China. His books have been translated into eleven languages.